From South Bend to the Soo. The Lake Superior State hockey program announced today that Canton native Zack Cisek has been hired as the team’s new assistant coach. Cisek rounds out an all-Michigan coaching staff for head coach Damon Whitten (Brighton) and Mike York (Waterford). Cisek, a former Michigan State goaltender, has been climbing the college hockey coaching ranks since his playing days at MSU. 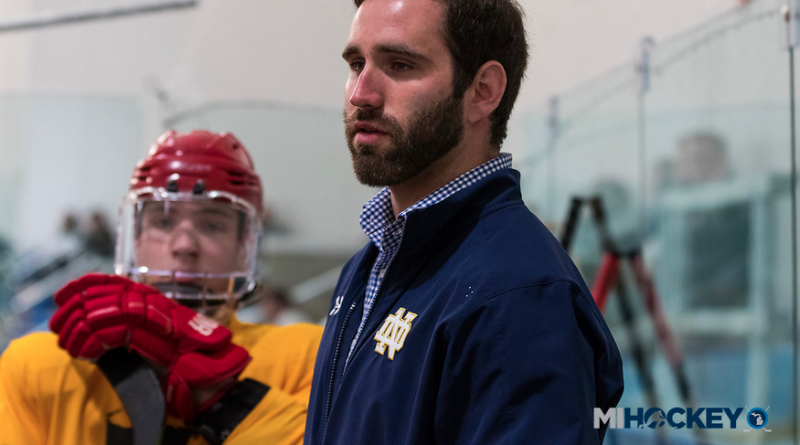 From 2015-17, he worked as a graduate assistant at the University of Miami, helping head coach Enrico Blasi with day-to-day operations, opponent scouting and film analysis, on-ice skill sessions and player evaluations. While in Oxford, he earned a Master’s Degree in Kinesiology and Health. Last season, he worked for former LSSU bench boss Jeff Jackson, helping the Fighting Irish during the program’s trip to the Frozen Four. Cisek was responsible for goaltender development, practice planning, individual film sessions and postgame film analysis. Cisek played high school hockey for Detroit Catholic Central before competing in the NAHL with the New Mexico Mustangs, Michigan Warriors and Traverse City North Stars.